CAO’s L’Anniversaire line was developed to celebrate their 30th year in the cigar business. Stronger than its Cameroon-wrapped counterpart is the CAO L’Anniversaire Maduro, which is made with an oily, toothy, dark-as-night Connecticut Broadleaf maduro. These box-pressed stogies flaunt tons of classic maduro flavor, including notes of cocoa, coffee, and black pepper, along with some earthiness and sweet spice from their Nicaraguan interior blend. The CAO L’Anniversaire Maduro has long been a staple smoke for maduro lovers—try some for yourself and find out why! I really liked these, good for the price. Came out of the box square & stayed that way? 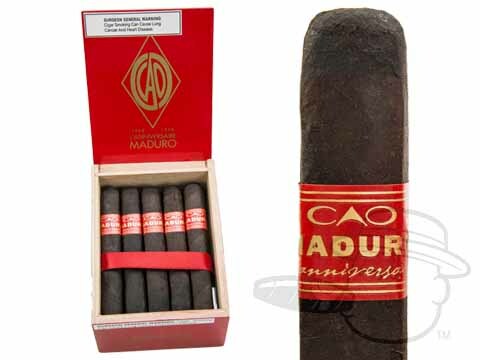 CAO L'Anniversaire Maduro Robusto is rated 3.4 out of 5 based on 1 customer ratings.